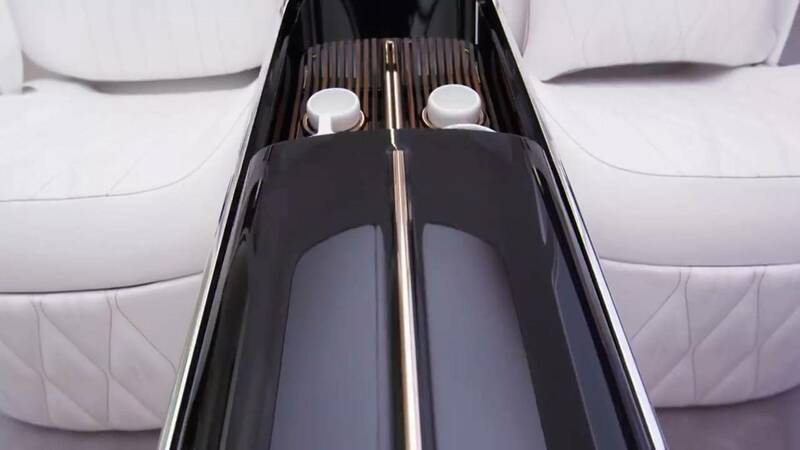 Courtesy of a 30-second-long video captioned “Luxury at its finest,” Mercedes-Maybach is announcing plans to unveil a new ultra-luxurious concept at the forthcoming Beijing Motor Show. As you would come to expect from a teaser, it does not reveal the identity of the vehicle, nor does it allow us to figure out the type of body style. That being said, latest intel suggests it will take the shape of an opulent SUV set to act as a preview for a Maybach version of the next-generation GLS. From what we’re able to see, the mysterious high-end concept appears to have a four-seat arrangement with individual rear seats separated by a massive center console. Numerous gold accents and Maybach logos have been plastered throughout the cabin, and there are also a bunch of white flowers between those comfortable rear seats featuring pillows. It looks like the concept will feature a retro-flavored split rear window in the same vein as the spectacular Vision Mercedes-Maybach 6 concept from 2016. Up front, there’s a “floating” center console wrapped around in the finest leather to match the cozy seats. For a brief moment, we can see the touchpad of the Comand infotainment system as well as three small screens built into the lower section of the center console to provide various details about the vehicle. The display in the middle appears to depict the silhouette of a tall vehicle with a raked roofline and extremely short overhangs. To spice things up furthermore, Mercedes has applied a great deal of aluminum inserts visible on the retro-futuristic steering wheel, center console, and also on the passenger’s side of the dashboard. Leather straps for the doors, even more leather on top of the dash, and a subtle wood trim – make the concept’s cabin ooze a premium feel. The Beijing Motor Show will kick off April 25 and that’s when we’ll get to see the new Maybach-branded showcar, unless an online reveal is scheduled to take place a few days sooner.